CINCINNATI — A local nonprofit organization is hoping a carefully designed placemat in the right Greater Cincinnati restaurants could help put a stop to violence against women and girls. 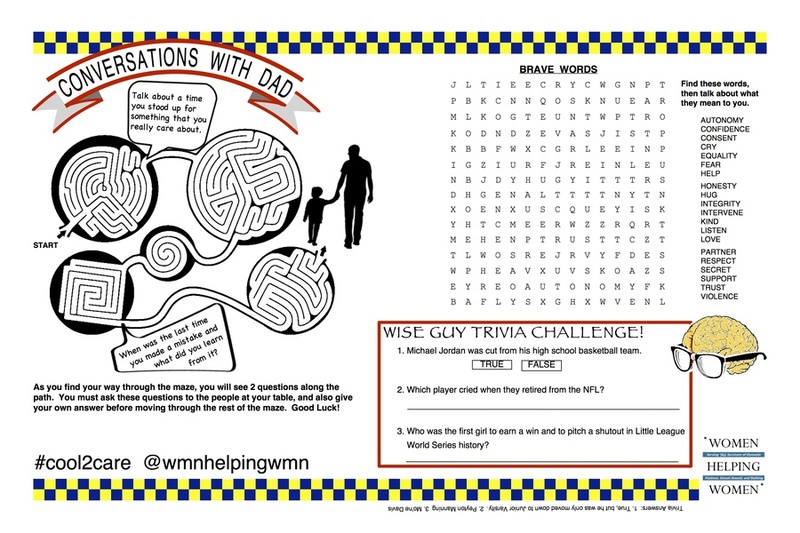 The placemat is covered in "conversation starters" to encourage mealtime conversations between dads and sons, uncles and nephews or other pairs of men and boys. The goal is to get them talking about their own emotional needs and how to respect women. The idea was born out of Women Helping Women 's participation in Studio C, a 12-week initiative funded by United Way of Greater Cincinnati that helps nonprofit organizations find new, creative solutions to especially difficult problems. Before you dismiss the placemat strategy, consider this: Kristin Smith Shrimplin, the CEO of Women Helping Women, has seen it work. She took her two nephews — ages 12 and 9 — to dinner at LaRosa's earlier this summer. As they were drawing pictures on a piece of butcher paper that the restaurant provided, she started using some of the conversation starters she knew were on the placemat prototype. "My nephews are obstinate. They think 'auntie' is too emotional," she said. "But I'm not kidding. We talked about — in appropriate language — what consent means. What inappropriate touching means and if that ever happens, what they're to do. We talked about how the 12-year-old hasn't had his first kiss yet, what that's like and how you have to ask. We talked about gun violence and if there's a gun in a friend's home, what they're to do. We talked about cigarettes, drugs and alcohol." Shrimplin talked with her nephews about important things in a non-threatening way, all while sharing a meal and drawing on paper. "They talked about it, they handled it, they were really leaning into the conversation," she said. "That just told me, if we could really roll out this concept, there could be some really neat organic things that happen in those moments." Hali Nacdimen, an industrial designer with downtown-based Kaleidoscope, sent initial designs for the placemat for Women Helping Women after spending more than an hour with Shrimplin and her staff to understand their mission and what they had learned about empowering men to help end gender-based violence. Em Joy, the nonprofit's school and community educator, created the prototype. 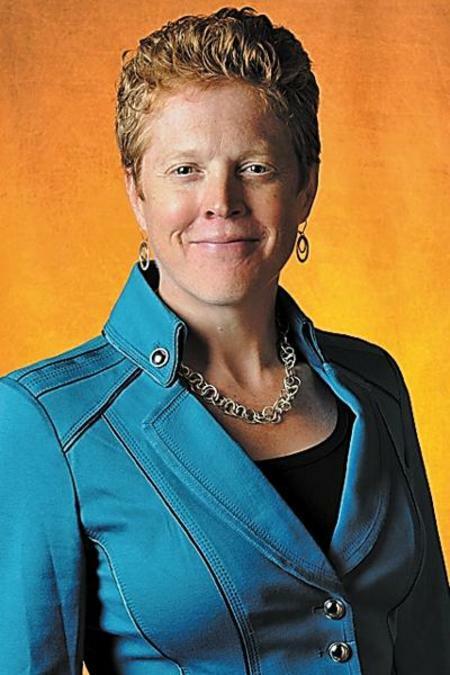 Women Helping Women's goal is to partner with an iconic Cincinnati restaurant chain — such as Skyline, LaRosa's or Frisch's — to get the placemats on tables across the region, Shrimplin said. The placemat idea was one of several that came out of the Eureka moment that Shrimplin and her staff had during their Studio C experience. During the 12-week program, facilitators from Design Impact helped Women Helping Women and the other participating nonprofit organizations determine what "wicked problem" each was trying to solve and then helped them boil it down to its most simple form. "Our wicked problem was we wanted to end gender-based violence by men being the leaders in the movement to address it," Shrimplin said. "It's not about men just being engaged. It's really about men being empowered." For years, Women Helping Women knew that involving men was an important part of ending domestic violence, sexual assault and stalking. But the Studio C process helped the organization expand its thinking about how to approach men and help them get involved. "Studio C helped us realize we have to really give men a voice," said Caitlin Burke, Women Helping Women's prevention coordinator. "We were assuming they had a voice and weren't using it for this issue." Studio C participants during a session earlier this year. The program's design thinking approach encouraged the organization to question its assumptions about men and to interview men to find out what they really thought about Women Helping Women's work and mission. "What I started to realize is men haven't been really given the opportunity — starting back in boyhood — to talk about their vulnerability in a safe way," Shrimplin said. "How, by the time they're 18 or 20 years old, can we expect them to speak out against violence against women and girls when they couldn't even speak out about their own emotional needs?" That realization pushed Shrimplin and her staff to find more ways to invest in men, she said. "We thought maybe what we need to do is invest in men and invest in their vulnerability and investing in creating a space where it is safe for them to be vulnerable," she said. The goal is to help men see strength in their vulnerability, not weakness. "When they feel strong in doing that, they can then speak out," she said. It might sound counterintuitive for Women Helping Women to start focusing on men, but that kind of solution isn't unusual for Studio C.
The program uses design thinking, a strategy that is common in the business world but less common among nonprofits, said Tamaya Dennard, a social and civic innovation specialist with Design Impact. "A lot of times it's really similar to the concepts of creative problem-solving," said Ramsay Ford, a co-founder of Studio C. "You start with really focusing on who is going to be using a product or service, who is the community that's involved in this solution or this program and getting a deep understanding of who they are, what their motivations are and how they're involved." This is the third year that United Way has been funding Studio C, and it's not uncommon for the process to challenge the assumptions of the nonprofit organizations that participate, said Mike Baker, director of community impact for United Way of Greater Cincinnati. The first year of the Studio C program, for example, the Housing Authority of Covington and Northern Kentucky Head Start partnered to try to find a way to get more kids from the City Heights housing complex enrolled in preschool. Leaders of both organizations believed that parents weren't enrolling their kids because they didn't have good transportation from City Heights to the locations where Head Start classes were held. Studio C challenged them to talk with parents to find out if the problem really was transportation, Baker said. "They talked to 10 to 15 families. And all of them said transportation was an issue, but it wasn't the top issue," he said. "Most often the top issue was 'my kid is too little to go to school' or 'they're going to learn everything they need to know in kindergarten.'" The Housing Authority of Covington and Northern Kentucky Head Start realized they needed to educate parents about what good preschool was — that it wouldn't require their squirmy toddlers to sit still at a desk all day. After they helped parents understand that, the two organizations tripled enrollment in Head Start in just a month's time. "That's the success for us," Baker said. "If we can drive more of that planning — moving past what we all think we know about the people we're trying to help and more diving in and really developing solutions that are much more tangible to the real issue." For Women Helping Women, the 12-week program made a huge difference, Shrimplin said. Now it's just a matter of getting those placemats in local restaurants. For more information about Women Helping Women, click here . For more information about Studio C, click here . Studio C is accepting applications through Aug. 11 for its next session. Meetings for that session will start Sept. 1. To apply, click here .